Hi there. I’m writing to let you know I will no longer be posting to speakerconfessions.com. You probably noticed it eons ago, as I haven’t posted here in some time. 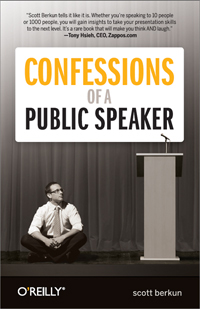 I strongly recommend you head over to scottberkun.com, where I do post regularly about public speaking and other topics. We like to think the world moves faster today than ever, but sometimes we’re surprised by how fast things moved in the past, including presentations. Enter the four minute presentation – a set of great techniques from 1917. New research on how speakers prepare, based on a study I did for ignite events. On tour last month I was in Mountain View, and spoke at Google HQ. You can read about it and watch the full video here. Did a webcast earlier this week to 500 folks about topics from Confessions. I went back in afterward and grabbed all the questions from the chat room during the talk and answered them all here. Lots of good stuff in there – it’s currently one of the most popular posts on my site. Mr. Berkun’s book is packed with tips on how to reduce anxiety and how to speak in public with greater effectiveness. They range from common sense—arrive early, make sure you have back-up copies of your speech, practice—to more advanced tips on what to do when 10 people show up to hear you in a 1,200-person room (cluster the 10 immediately), how to cut off rambling questions and how to fall silent after making a key point, to give the audience a chance to soak it in. Read the full review on WSJ.com here. Teaser video for Confessions book – Now up! The first in a series of videos O’Reilly Media has made for the book is up. This also appears on the amazon.com page along with the sample chapters. The book is on the home stretch. Copyediting is done, the galleys are being reviewed. And most important perhaps, some early praise has been rolling in. In just a few weeks it will be on sale and in stores. A sample chapter will coming soon, but you can pre-order on amazon right now.